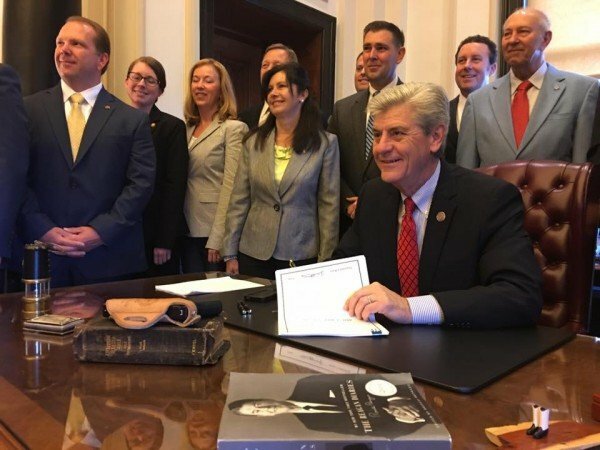 The bill that Mississippi Governor Phil Bryant signed last week with a pistol on his desk made widespread news over its provision to allow armed security in churches. Backers call it the Church Protection Act. It also loosens the state’s open carry law, making it legal to carry a holstered weapon without a permit. In passing such a law, Mississippi becomes the ninth state to allow open carry without a permit and the third state to pass such a law in recent months. Last month, the Idaho governor signed a bill allowing permitless concealed carry within city limits. And in West Virginia, the legislature overrode a governor’s veto allow complete constitutional carry for anyone over 18. In Mississippi, as in West Virginia, the law was passed against the best wishes of law enforcement. The state’s Association of Police Chief of Police say the law dismantles the state permit requirements and makes it harder to know if a violent criminal might be possessing a weapon, reports the Washington Post. The bill was written in a response to the church shooting in Charleston, but several church leaders even in violent neighborhoods say they will continue to ban firearms from their congregations. They can still do that under law, which sets up provisions for training armed security at churches.